We are a family that likes to have snacks and desserts. Every week I bake something sweet but it has to be easy. Once in a while I’ll take on a recipe that requires a few extra steps and cross my fingers that everyone will like it. 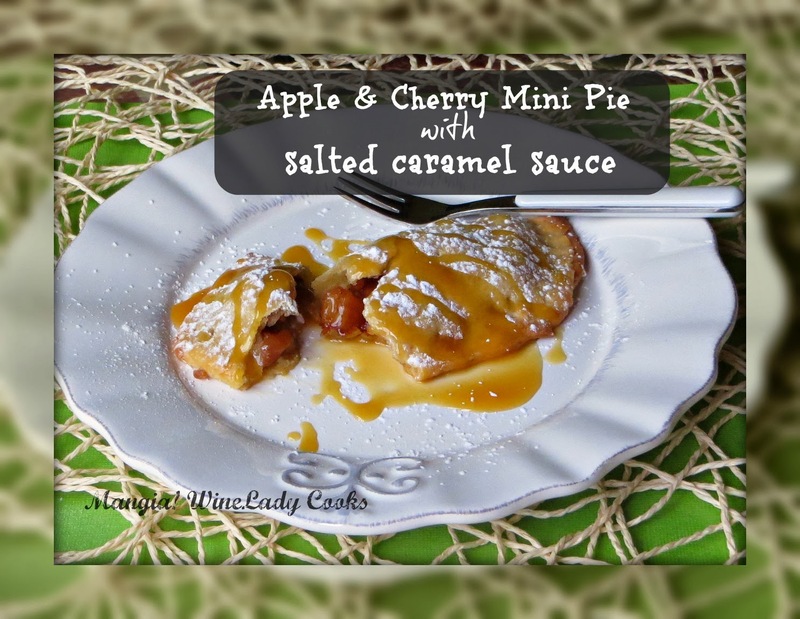 These apple cherry mini pies were easy as pie. I was inspired by the hand pies, empanadas, and mini pies that were floating around after Labor Day. It took me a while to get started but when I finally got to making these everyone enjoyed them. I used a simple pie crust recipe but you can use pre-made pie crust and save a lot of time. For the filling use any seasonal fruit you like, chop in small pieces, mix the fruit with sugar and spices and then add to the pie crust. Simple! If you have a food processor it will make the dough-making process quick and easy. Peel and cut the apples in small cubes. Drain the cherries and chop them into small pieces. In a small saucepan add the fruit, the lemon juice and sugar to taste. Cook for 2-5 minutes just to soften the fruit and combine the flavors. Set aside while you prepare the crust. Cut the pie crust into 3-5 inch circles – it depends on how big you would like the pies. Place 1-2 Tablespoons of fruit in the center of each circle. Using a little water dab it around the edge of the circle then fold over the dough sealing it with the tines of a fork. Continue this process until all the fruit and dough is used and brush the tops of the dough with egg white. Bake at 375 for about 20-30 minutes until they pies are a nice golden color. I sprinkled the pies with powdered sugar and added homemade salted caramel sauce. If you enjoy small pies you might enjoy Apricot Pie Pops from The TipToe Fairy. I adore apples and cherries together. You are right – a simple quick and easy addition to meal time!